Transfer music, movies, online videos, photos, books from Mac to iPod in fast speed. 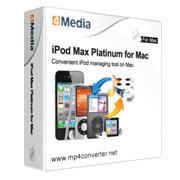 Convert CD music, Home DVD movies, and online videos to iPod compatible audio/video files. Embed the most popular online video websites.